Rocklands Barbeque and Grilling Company is easy to love, and impossible to hate. Between the food, service, and atmosphere, it’s one of the best when it comes to good ol’ happy barbeque. I’ve loved Rocklands since I moved to Washington, DC almost three years ago. I spent my first two years going to the Glover Park – Washington, DC location and now frequent the Clarendon – Arlington, VA location (they have locations in Rockville, MD and Alexandria, VA as well). Although the Glover Park spot is much smaller than the Clarendon one, it packs the same punch with food, condiments, service, and experience. The Clarendon location, however, does have a full bar, patio, and TVs for good summer happy hours and better large-crowd accommodations. Red Oak and Hickory fueled ovens make an awesome smoky flavor. Nothing is frozen, all meat is fresh, making for tender rib meat, flaky brisket, and a perfect chicken char. Lots of variety fits any mood. I have to mention their potato rolls are the best too – always soft and a perfect one-hand pocket for meat and sauce. A big variety of fresh sides – some traditional southern ones and other standards, some healthy and some not so healthy. Pair two up with a meat/sandwich for a perfect meal size. Adding two sides is onl $4 making a whole plate around $8-9. So many to choose from. Some hot, some not. Some bold, some light. Some thick, some thin. Some local, some international. Rocklands original homemade sauces are good standards if you are not very good at making a decision. Sometimes too smoky where you smell like a fire pit when you get home, but that’s what you should look for in these types of places. It contributes to the meal and the experience. It’s a happy place, the people are happy and the food is happy. You never feel rushed, and always leave full. Good for a solo trip, a first date (she’ll be a keeper), a weekday dinner out, or a weekday dinner to go. 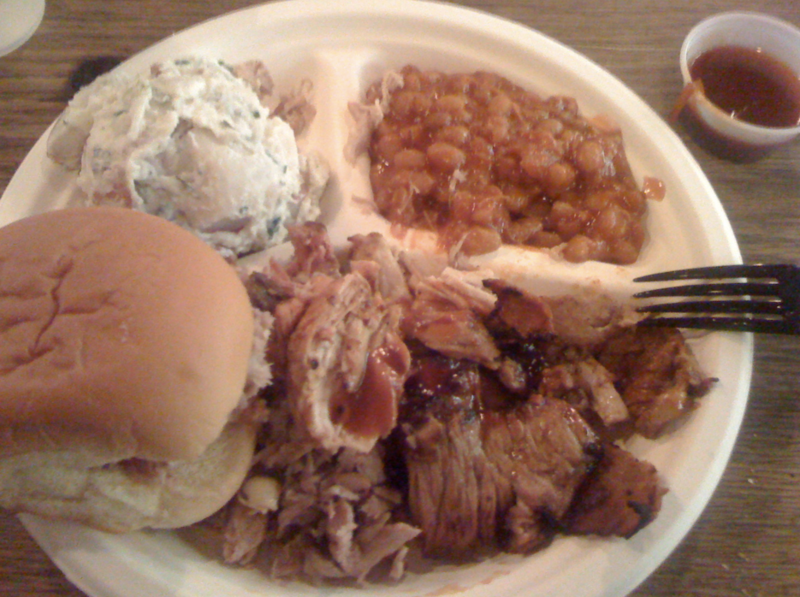 Get the “Three Meats Platter” if you’re starving or the “Pulled, Smoked Chicken” for a moderate amount. For sides, the potato salad and the BBQ baked beans are so very necessary, but go with the mac and cheese if you are feelin’ it. Tiger Sauce – Mild heat and mildly sweet. Best flavor. J.T. Pappy’s Gator Sauce – Different levels of heat, very unique flavor from a zesty mustard-tomato base. Pickapeppa Sauce – Mild, sweet, and mellow Jamaican sauce. Rockland’s Original BBQ Sauce – Get it hot out of the barrel, with onions. It’s mild but a perfect sauce for a dip of the sandwich or pouring over potato salad.